one happy little crafter: Anything Goes with The Cutie Pies! Anything Goes with The Cutie Pies! Hello and Welcome! So its the first Monday of my holiday at it was sooo nice not to be woken by the plinky plonky music of my alarm tone. Got a busy week planned though as we embark on decorating both of the kids bedrooms. who are offering a fab digi stamp prize, but you gotta be in it to win it! Haven't made an easel card for a while, so I thought this would be that way to go for my DT card. I've used one of the adorable images that we were given to play with, which is coloured with promarkers. I've used hobby house pearls to create an alice band too. The image is cut with a Go Kreate die. The papers are from Joy Craft "blooming rose" and the button, thimble charm and bakers twine are from stash. This is gorgeous Lisa. 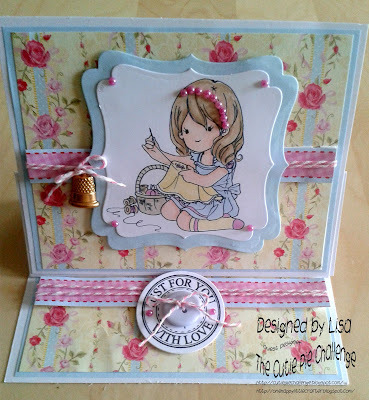 I love the pretty image, beautiful papers and the thimble charm is fabulous. Super pretty card Lisa - love the DP's and the cute thimble. Third post of the week!